Clonliffe made the now annual trip up North today for the IAAF Belfast International cross country. There was a new venue for today’s event the Billy McNeill centre of excellence in Belfast. A testing course featuring several long hills which were quite sapping on the legs featured on 2K lap, although the general view of the athletes was that it was a good course with good running. Some 25 young clonliffe athletes were competing over the course of the day`s competition. First race featuring our athletes was the combined women’s Junior/ ages 17 race. This was a big test as the race also included the Celtic International with top Junior and age 17 athlete from the home international countries so it was a big step up for many of our young athletes. The girls however gave an excellent account of themselves particularly young Sarah Bateson who continues to impress with an excellent run 26th place in the age 17 race in a time of 16.48 . Aoife Hession also had an excellent run finishing 30th in 17.33 with Alana Fitzsimons only seconds behind, 32nd in 17.47 . With the competition decided on the first three home the Clonliffe girls combined excellently to finish in 3rd place in the club competition. This scoring trio were superbly backed up by Ella Brown 36th in 18.25, the fast finishing Katie Halpin 37th in 18.30 and the youngest member of the travelling party Ella Cooley 38th in 18.41. Of the junior women fine runs from the two girls Ale Fernandez 44th in 17.40 and Hannah Browne 45th in 17.57. There was another big field assembled for the combined junior men and boys age 17 race again a great Clonliffe presence and it was a particularly gratifying to see no less than 15 black and amber vests line-up. From the starters gun Ben Guiden and Efrem Gidey got off to excellence starts, pretty soon Efrem had latched onto the lead international athletes and with a lap to go had himself up in 2nd place but with problems with his spikes he literally slipped back a couple of places and eventually finished in an excellent 4th place in 19.16. Ben suffered a bit mid race but rallied superbly to battle back to finish in 36th in 20.37 with Stephen Cashin having having yet another top run to 39th 20.42, next in was Aaron Cullen who finished in 43rd place in 21.06, considering that Aaron is only making his way back after injury this was an unexpected bonus. Great runs also by Ryan Sheridan 22.07, Ian McAlweeney 22.34 and Jordan Byrne, who was visibly carrying an injury 22.47. Of the age 17 athletes they were most encouraging performances in particular from Callum Simpson who finished well up the field in a time of 21.10, with Evan Foster breathing down his neck 21.13. Next was Alex Murray 22.07 Niall Carbery 22.34, Dermott Buckley 22.49, John Lawrence 23.32, Alex Nuroth 23.44 and Manny Oakley 24.56. Unfortunately the result of the junior men boys 17 inter club race is not yet to hand but again the Clonliffe teams performed superbly. In the men’s international race Sean O’Leary who has only left the junior ranks as of January 1st stepped well and truly to the mark. Running in the Irish colours on the international under 23 team he did not look out of place and finished an excellent 16th place overall in the senior race, over 10,000m, and 2nd U/23. An excellent senior debut. Sergiu Ciobanu started the race but unfortunately a chest infection conspired against him and he had to call his day`s work to a halt after the first lap. It was once again a most worthwhile exercise to bring these young athlete to an international cross-country event such as this. In particular for the junior men’s team represented possibly the final opportunity to impress the club captain with the team for Portugal to be selected and finalised this week. As always it was a pleasure to spend the day with these young Harriers. A fantastic bunch! 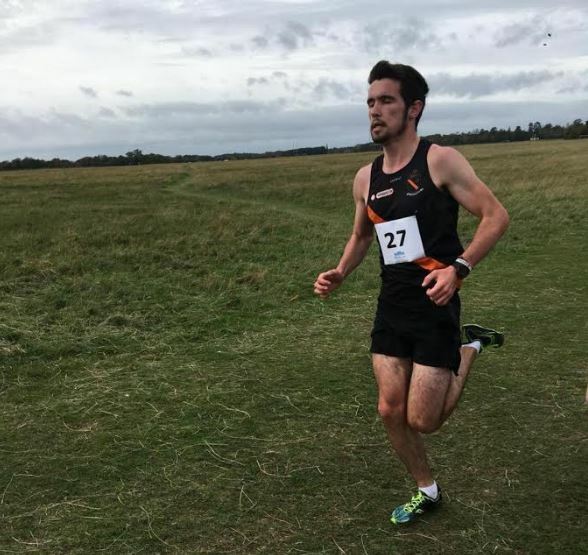 Clonliffe Harriers will make the annual trip up North on Saturday for the IAAF Northern Ireland international cross-country. The bus will leave Morton Stadium at 9 a.m. sharp returning on Saturday evening at approximately 7 or 8 p.m.
As has been the norm in recent years strong underage and Junior teams will run in the Clonliffe colours. The Clonliffe National junior team champions will feature strongly in the team competition. 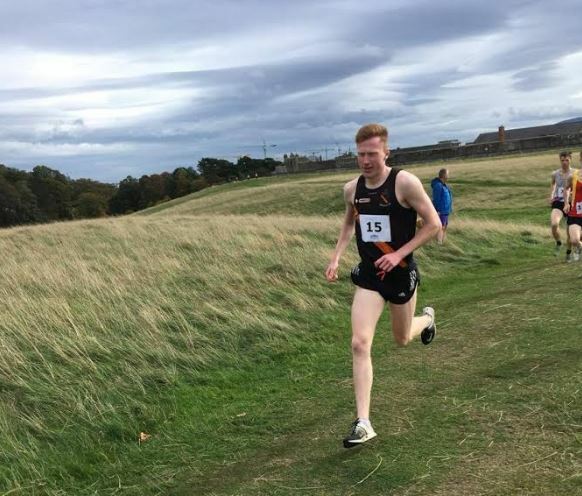 The club captain is specifically using Saturday’s race as part of the teams preparations for next month’s European junior clubs cross country championships in Portugal. That combined u 17 and 18 teams, both boys and girls, will give a good account of themselves and will challenge strongly in the club event. Also competing will be a full junior women’s team. Sean O’Leary will be running in the Irish colours making his u23 debut in the senior race. The very best of luck to all our athletes and teams on Saturday. 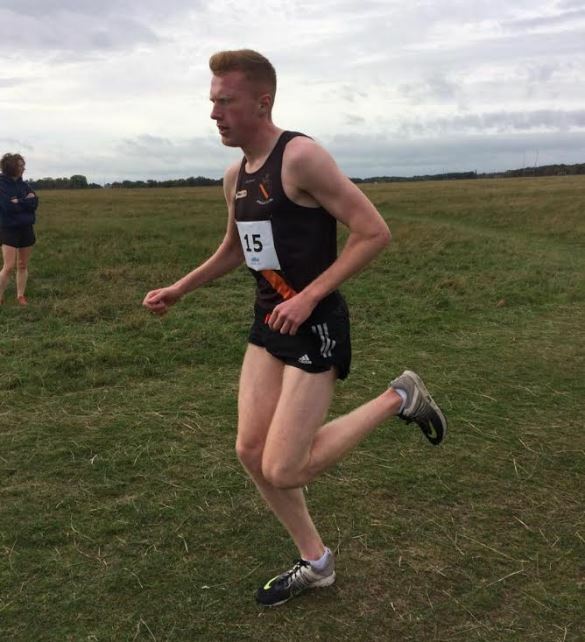 Sean O’Leary after his outstanding eight place finish at last month’s European junior cross-country has been selected to run for Ireland in the Northern Ireland international cross-country in Belfast next weekend Sean will run on the u23 team. Sean will be surrounded by familiar faces up north as several clonliffe teams will also compete on the day. The men’s junior team will use the event as part of their final preparations for next month’s European club cross-country championships The clonliffe junior team is : Efrem Gidey, Ben Guiden, Aaron Cullen ,Thomas Balthazar, Ryan Sheridan, Jordan Byrne,Ian McAlweney and Stephen Cashin. Incorporated in the junior race is the boys 17/18 this team is Alex Murray, Callum Simpson, Alex Neuroth, Dermot Buckley, Evan Foster, Manny Okaye, Niall Carbery. Also competing will be a junior women’s team of Hannah Browne, Ali Fernandez Tess Loftus and Amy Warren and U17/18 team of Sarah Bateson, Ella Brown, Aoife Hession, Alana Fitzsimmons, Ella Cooley and Katie Halpin. It”s beginning to look a lot like Christmas, with only days to go it’s a quiet weekend on the racing front. 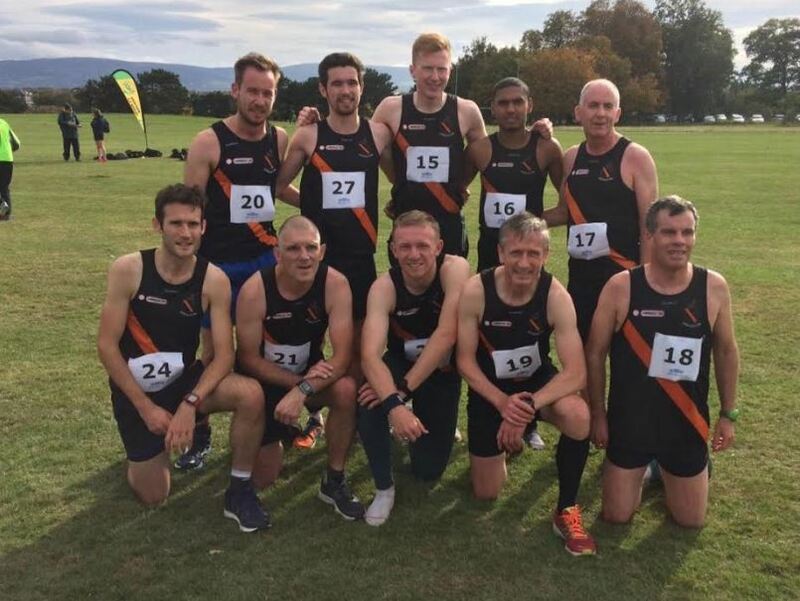 The only race we are aware of with Clonliffe interest was yesterday’s 35th running of the O’Rourke Shield in Malahide Castle grounds won by Murray Ahern, 2nd was Noel Daly, 3rd Tom Cassidy. Fastest time was Murray Ahern 18.15 for the 5k xc run. 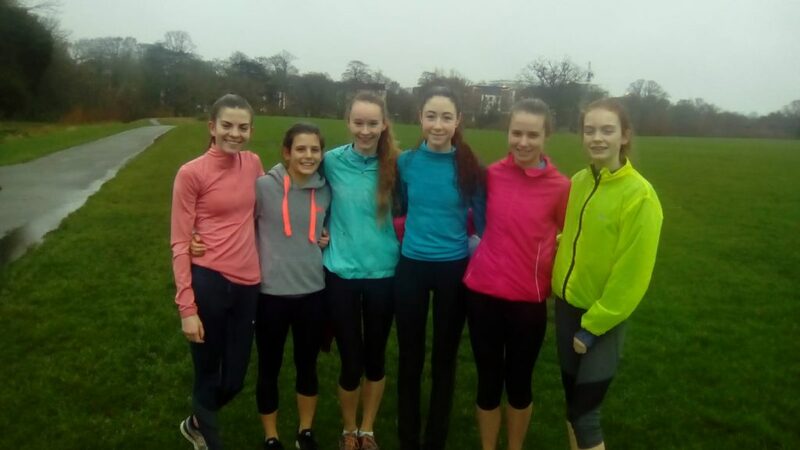 Today in the final training session before Christmas day the girls cross country group welcomed back Jenna Cida who was here from her home in Barcelona for a couple of days. A nice 50 minute run in the rain in Santry Demesne was the fare on offer. Needless to say despite not having run for a few months the Judo champion was still fit enough to comfortably complete the Sunday long run. A reminder: don’t let your Christmas racing schedule miss out on the ERP Xmas Cracker 5k in December 30th. Enter on line today! This Saturday (please note it is not Sunday!) 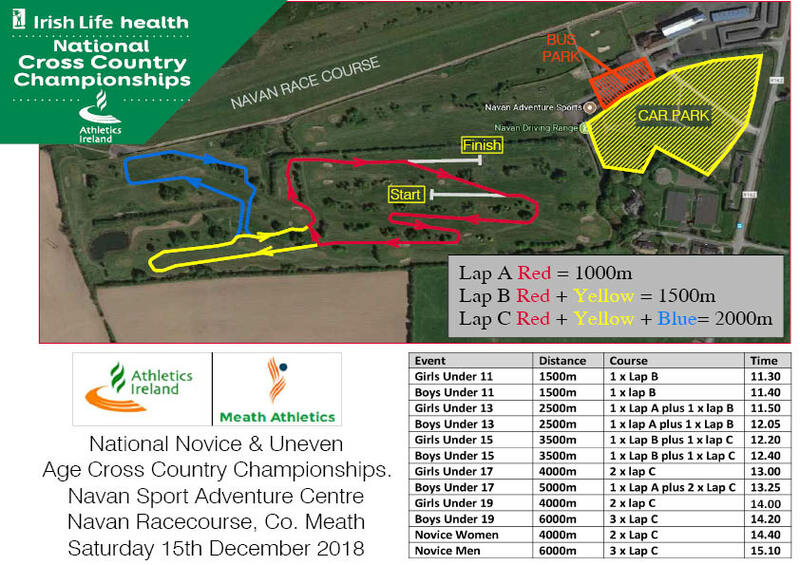 the 15th the final cross country event of the 2018 season takes place at Navan Racecourse. 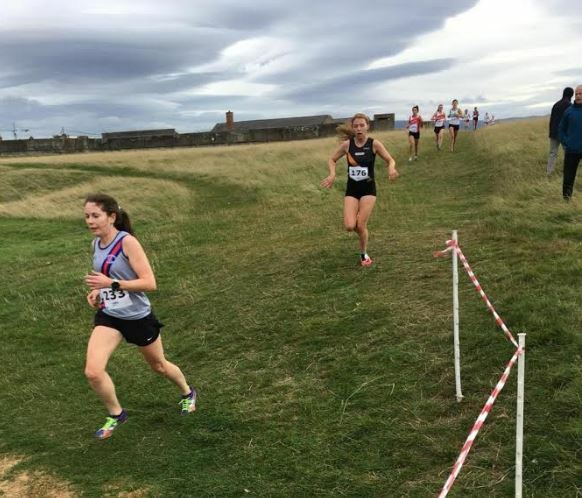 The National Juvenile (uneven ages) and National Novice Cross Country Championships will feature many of Clonliffe Harriers up and coming future stars. There are Clonliffe teams competing from U/15 up to the novices. Indeed the novice race traditionally has been the biggest cross country race of the year with athletes racing for their respective clubs from 19 years of age upwards. Boys U/15: Jack Woods, Sean Boyne, Ronan Donohue, Andrew Gaffney, Cillian Sherrin, Jacub Niedziolka. Girls U/17: Sarah Bateson, Ella Brown, Ella Cooley, Alana Fitzsimons, Aoife Hession, Katie Halpin. Boys U/17: Darragh Carter, Callum Simpson, Alex Murray, Niall Carberry, Evan Foster, Dermot Buckley. Girls U/19: Hannah Browne, Aimee Warren, Tess Loftus, Cliona Cooley. Boys U/19: Efren Gidey, Ben Guiden, Jordan Byrne, Daniel Lacy, Stephen Cashin, Ryan Sheridan. 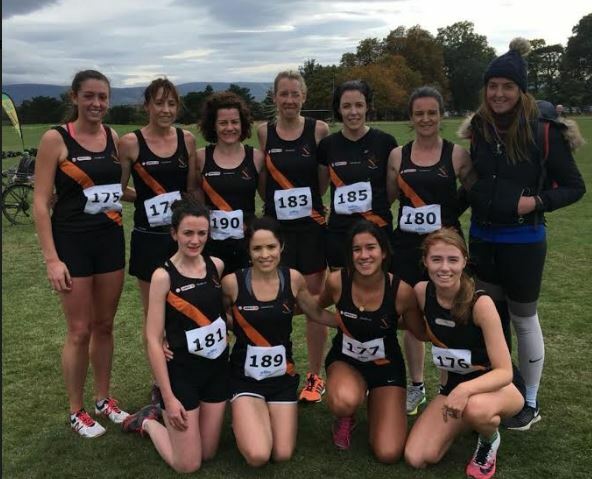 Novice Women: Alannah Cooley, Ale Hernandez, Orna McGinley, Emer Brennan, Elaine McLoughlin, Karen McAffee, Yvonne McDonagh, Laura Kiernan, Paula Horgan, Sharon Lawlor. Novice Men: Peter Bissett, Sean Carrigg, Michael Cassidy, Anthony Doran, Sean Doran, Mark Doyle, Greg Hosseny, Jarlath Jordan, Jack Maughan, Eoghan Murphy. Meeting times: under age contact your coach. Novice women race at 2.40pm, meet there 1.30pm. Novice men race 3.10pm, meet there 2.00pm sharp. Missed last weekend was a good run by Jayme Rossister to a 4th place finish in a classy field in a British League cross country race. 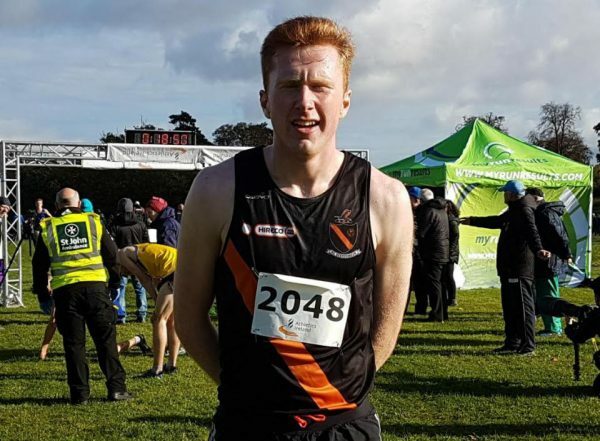 On to this weekend and the BHAA Irish Life 6k cross country race in Santry Demesne on Saturday where top Clonliffe runners were Sean Doran 5th in 20.15 and Tom Sherlock 8th (20.33), 70th Peter Bissett 23.34, 103rd and 7th woman Orna McGinley 25.04, 147th Declan Grant 148th Laura Kiernan, 171st Yvonne McDonagh, 190th Karen McAffee, 198th Colm Doran. (Thanks to Orna for results). Also the Varsaties Road Relays on Saturday in Maynooth saw a fine 2 mile leg for DCU by Cathal Doyle 9.32 to see DCU B take silver behind DCU A. Greta Streimikyte ran a 11.59 2 mile leg for DCU C while Alannah Cooley ran her 2 mile leg in 12.20. The Autumn Open Cross Country took place after the Dublin juvenile championships in Abbotstown this afternoon. The even acts as a trial for the Irish Masters Athletics teams for the up coming British & Irish Masters International, and also includes both seniors and juniors in a mass start. This can lead to some confusion with athletes peeling off to finish whilst others still race on. Race winner in some considerable style was sub 4 minute miler Sean Tobin (Clonmel AC). From a Clonliffe perspective best run of the day came from Sean O`Leary 2nd junior (18.19 for 6000). Good runs also over 7,500m by Cathal Doyle 9th senior (23.11) and 3rd U/23 and Colm Rooney 1st M35 (23.42), 30th Eoin Taggart (24.21), 41st Tom Sherlock (25.23), 45th Sean Doran (25.44), 48th Adam O`Brien (25.56), 58th Greg Hossenny (27.07), Bernard Feely (31.38) and Jimmy Bennett (34.09, 6000) and 1st M80. The sole Clonliffe lady racing was Alannah Cooley 39th in the senior race. Also in the USA Hope Saunders continuous to make progress and was once again racing for Wichita State over the weekend, her third race so far this season. Hope placed 101st over 5000 (21.20) at the Fort Hays State tiger Open in Victoria, Kansas. No news from our other “North American” Brian Flanagan, but maybe he`s working on a “Letter from America”? Ulrik Nyberg reports from Somewhere in Ireland: Very excited about what the destination of the Magical Mystery Tour might be, about 40 young Clonliffe athletes entered the team bus early yesterday, Sunday, morning together with their coaches. After a long and adventurous journey through the beautiful countryside around Naul, which included race bicycle counting, singing and many “are we there yet?”-questions, we reached our destination Stamullen, Co. Meath where Star Of The Sea AC held their 30th annual cross-country meeting. We had runners in all the youngest age groups from U/9s and upwards. Some of our athletes ran their first cross country race ever and everybody really put in great efforts. Before getting back on the bus for some more singing and a “treat stop”, we enjoyed a picnic lunch together in the autumn sunshine. All together it was a great day out with lots of fun and bonding between athletes and coaches. Gladys is planning more Magical Mystery Tours so: Roll up! Roll up!